William Rogers (extant 1589-1604) was one of the most important English engravers of the Tudor period. 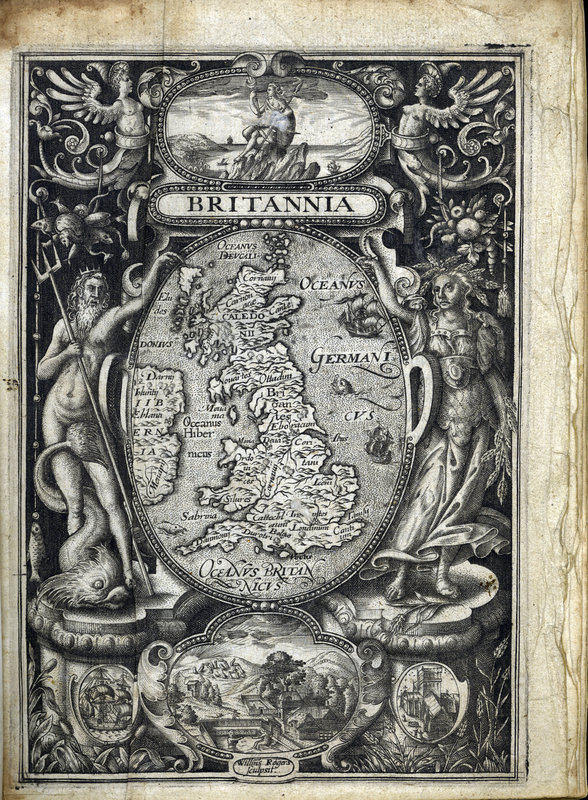 Trained as a goldsmith, the engraving he executed for the fifth edition of William Camden’s seminal antiquarian work, Britannia, is full of symbolism. At the top, Britain, personified, sits on a rock with spear and standard in hand. The map of Britain, imprinted with the names of pre-Roman tribes, is flanked by Neptune and Ceres, depicting fertility on both land and sea. At the bottom, a ship, Stonehenge, Roman baths, and a church symbolise Britain’s formidable navy, her history, and strong Christian faith, respectively. Despite its position, to the right, this engraving is essentially a frontispiece, not a title page. [Willliam Camden], “Britannia,” ourheritage.ac.nz | OUR Heritage, accessed April 20, 2019, http://ourheritage.ac.nz/items/show/10665.